1Heart Caregiver ServicesTM (1Heart CS) http://www.1Heartcares.com is a premier In-home care service company that provides professional private care duty to seniors and adults requiring assistance in their home and healthcare needs for the past 11 years. The company is run and managed by healthcare Executives with local and international training with combined top level executive work experience of more than 50 years. 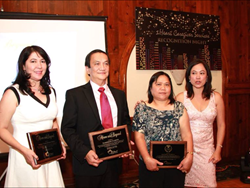 CEO Belina Tagarao is a Los Angeles IMAGE AWARDS honoree 2013 and HiFi 2014 Fil-American awardee as HiFi Ambassador of Goodwill within the Fil-American business community in Los Angeles. 1Heart CS is the only In-Home Care company that has its in-house ‘Caregiver University’ spearheaded by Training Director Randy Neil in Southern California area that provides professional caregiver training held at its Los Angeles head office aligned with its ‘Continuing Professional Education’ program implemented to all corporate managers and staff of the company and extended to senior living facility requiring in-service training for their staff. The Staffing department headed by Staffing Officer Jennifer Remigio, Charlotte Baseleres and associate Bernadette Manahan takes charge of staffing solutions to all cases, hiring, payroll and screening of all applicants and update of caregivers, CNA and HHA data base that can readily be assigned to new and existing cases handled by Client and Care Managers Arnold Navarro, Anne Capili, Shirley Billedo and Andrei Peralta assigned in each target County. The company Vice-President of Operations Kevin Tagarao has consolidated the company’s daily operations, established online web presence and facilitated integration of new technologies. The company carries out a ‘Circle of Care’ process that is uniquely implemented by all 1Heart Managers and remains unmatched by any senior care service company. 1Heart CS is a Certified Member of CAHSAH, California Association for Health Services at Home, Los Angeles Chamber of Commerce, Conejo Valley Chamber of Commerce, BBB and operates in Los Angeles County, Orange County, Ventura County, San Fernando Valley, San Bernardino County and Santa Barbara County area. A fast growing Medical Billing company that helps physicians and other medical and healthcare companies obtain payment from insurance carriers and patients by effectively handling insurance claims and aid them to manage their practice and finance side efficiently. Summit Medical Billing with its staff Arielle, Pauline and Christina aims to establish a strong alliance with the American Medical Association and continue to provide help to their members increase their revenue with the efficient handling by the company’s billing expert.